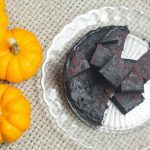 Rich paleo Instant Pot chocolate brownies with a hint of pumpkin, so moist and rich without being sweet. 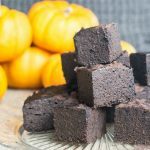 These Instant Pot Pumpkin Brownies come together in one pan and are SO easy. I love my Instant Pot, I use it nearly every day, and now that I'm packing up my apartment to move I'll use it for every meal. Then the pots and pans can go into boxes. Heck, I may even pack up the bowls and plates since it's just me here! I'll sit on the floor eating directly out of my Instant Pot. How is that mental picture for a sad lonely single girl? LOL. Obviously, my baking pans are going into a box too. But what will happen when I need a brownie suddenly while packing? 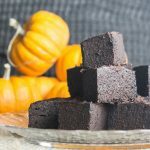 These single pan Instant Pot Pumpkin Brownies will save the day! We posted one of our first recipes (One Pan Nut Brownies) on social media a couple weeks back, and Raj's darling mom, Ruth, commented asking how long this recipe could be cooked in the Instant Pot for. It was a great question, and I had no idea. I haven't used my Instant Pot much for baking, and really haven't done much regular baking lately either! So I set to work, I made the 1 pan brownies according to the original recipe. 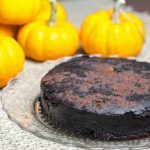 Then I made them again but used the “Cake” setting on Raj's new Instant Pot Ultra. I was busy and left it to natural pressure release. They were delicious, but a little soft. 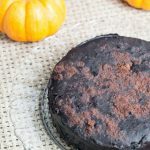 I made them again with a pumpkin puree instead of the melted chocolate of the original recipe, and a quick release, still too moist. 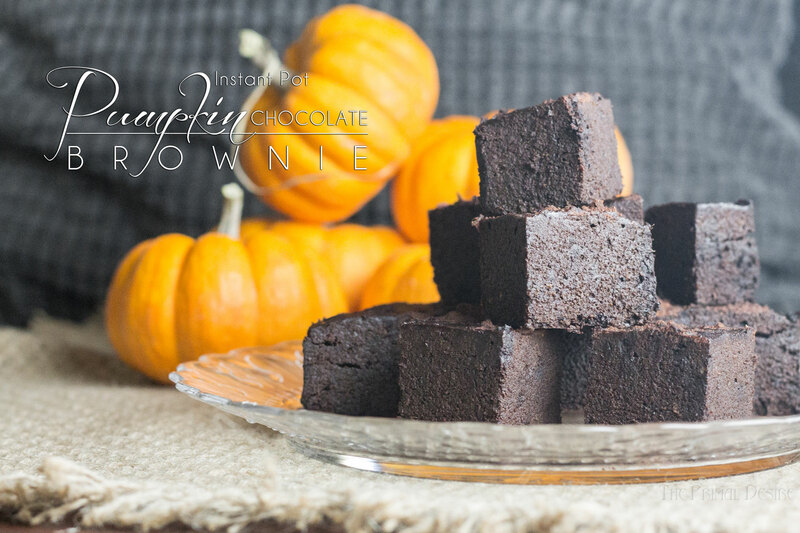 Can you believe there is such a thing as a brownie that is too moist? (Sorry for all the “moists” for people who hate that word. Maybe succulent is a better word). After a few attempts, I got the texture I wanted with rich chocolate, a hint of pumpkin, and the pumpkin spice on top, and I love pumpkin spice everything! Now I want to convert all of our paleo or gluten-free recipes to Instant Pot versions! So watch for that – probably once I'm in the new house! Only 2 weeks!! Soften the coconut oil or ghee so it is liquid. Combine all ingredients in an Instant pot-friendly pan (I love this one) or bowl and stir well. Add 1 cup of water to your Instant Pot and place the brownie pan on a trivet inside. Close lid and make sure vent is closed. Set on High pressure for 40 minutes, or use the cake setting on your Ultra model. Quick pressure release and remove letting the brownie cool completely before eating! Brownies in the instapot? wow! Just tried this, very wet, first time in trying to make something in the spring pan. I know that you have to be really careful in removing the lid as my brownie got wet. I will let it cool and see how it taste. When I tested this recipe I had more than one ruined by getting wet. I used a makeshift tinfoil layer, napkin and another tinfoil layer to catch some moisture and protect the brownie. You could also use a slick silicone lid like this one. Always let it cool before taking out of the pan, or you end up with a mess.